For wide angle Wednesday, here’s an image of Mr G amidst percolating gas bubbles, taken at Sangeyang Island, in Northern Komodo, Indonesia. Sangeyang is an active, simmering volcano. The island was evacuated several years ago, although a few brave souls remain in a rudimentary village, perched on its beautiful shore. 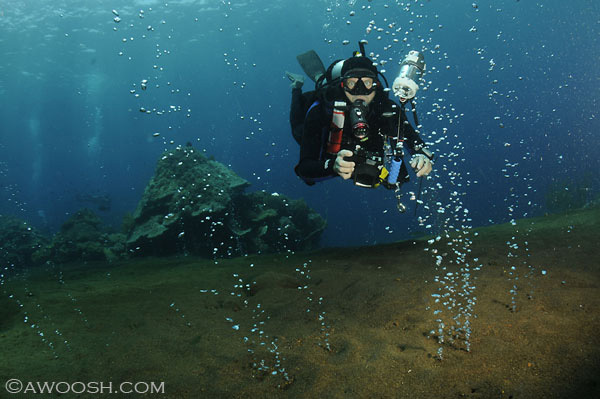 We did a couple of dives with these “champagne bubbles”, at a site called Hot Rocks. It was pretty surreal – I am not aware of anywhere else in the world where divers can have this experience. Nearby, there are also some “vents” where very warm water seeps up through fissures in the reef – which makes for some pretty groovy hand-warming stations ;^) And, it would appear that the critters like the jacuzzi too – this site was well populated with a cool cast of stuff, and the coral gardens in the shallows were lovely as well. To read more about this bubbly diving, and see more images captured at this site, you can follow this link to my story. This entry was posted in All About Scuba Diving, Photography, Pic of the Day and tagged Hot Rocks, Sangeyang Island. Bookmark the permalink.